With EverWood and EverTile, the beautiful floor you see now is exactly what you will enjoy for years to come. For the home it is elegant and contemporary, with remarkable long-life durability that will accommodate even the high-traffic needs of commercial spaces like hotels or restaurants. EverWood and EverTile are the ultimate in fashion and performance. Top layer and core are both impervious to water to prevent water damage. Ultra-thick .5mm wear layer is designed to handle commercial environments. The room in which the floor is installed as well as the one below remain quiet thanks to noise-dampening CorkPlus™ attached underlay. Spills and messes are easily wiped up with a damp mop. Highly stain resistant. Your feet will thank you – even when it’s cold, your EverWood or EverTile floor will stay warm to the touch. And don’t worry about waking up the baby: our floors are quiet, in the room and below, thanks to TORLYS CorkPlus™ Underlay. Your stunning low-gloss floor with realistic wood and tile textures are the perfect match for any decor. EverWood & EverTile floors are hypoallergenic, making it perfect for important allergen-free rooms like bedrooms, family and living rooms. Built tough for kitchens, bathrooms and basements. EverWood & EverTile is well-equipped to conquer damp basements, kitchen spills and bathtub run-off. EverWood & EverTile are 100% waterproof from top to bottom. Maintenance is always easy with an ultra-thick, stain-resistant wear layer. Spills wipe up quicker and easier than hardwood. 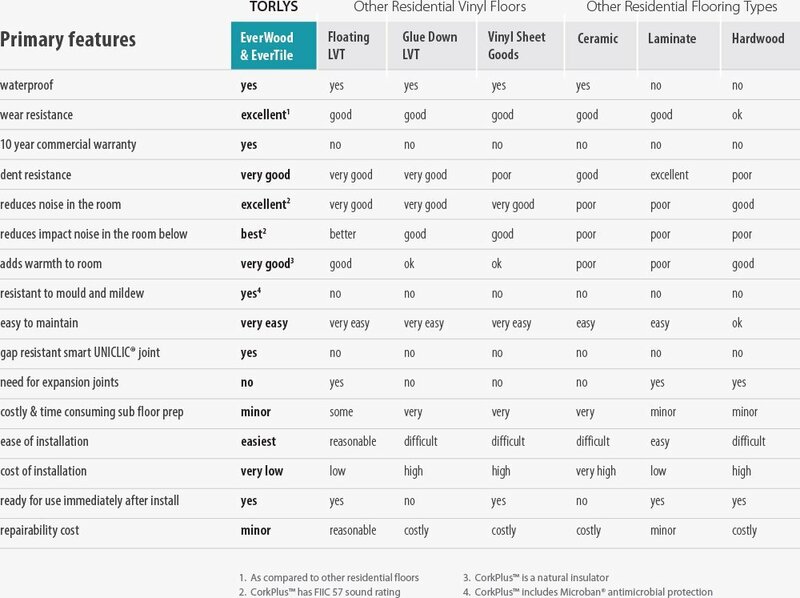 When researching your preferred flooring, compare TORLYS EverWood & EverTile to those in similar categories. No worries about sub-floor imperfections. Subfloor imperfections are less of an issue with EverWood & EverTile. Most LVT / vinyl floors are thin (5mm, 4mm, 1/8” or even less) and many of them need to be glued down. They require an almost perfect subfloor preparation, otherwise they will telegraph every imperfection. TORLYS Everwood & EverTile is 5/16” (8.3mm) thick, has a built-in CorkPlus™ attached cork underlay resulting in a very forgiving floor for small subfloor imperfections! If a glue-down installation is preferred, with TORLYS Smart Tape you can install fast and easily without any concerns for adhesive odours, VOC emissions, or even the set-up time that some adhesives require. And you can walk on your floor immediately as it is installed! Use TORLYS Smart Tape for Added Convenience. Installations against a brick wall, fireplace hearth or a curved surface like a staircase can be an issue with other floating floors because they may shift and move. Make installation easier by using TORLYS Smart Tape to anchor the first rows of planks in place and stop any movement. Please check complete installation instructions for details. Both side and end joints utilize Uniclic® joint technology. 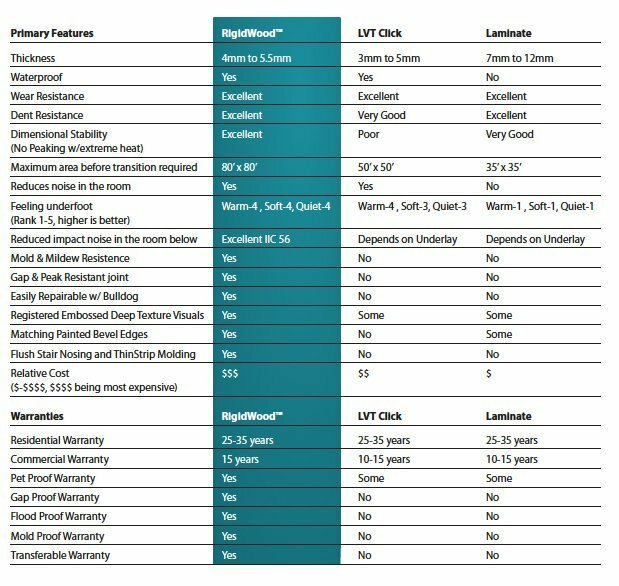 The patented Uniclic® system was exclusively engineered for EverWood & EverTile and is the only floor backed by a gap warranty. Wood grain contours are softly textured. 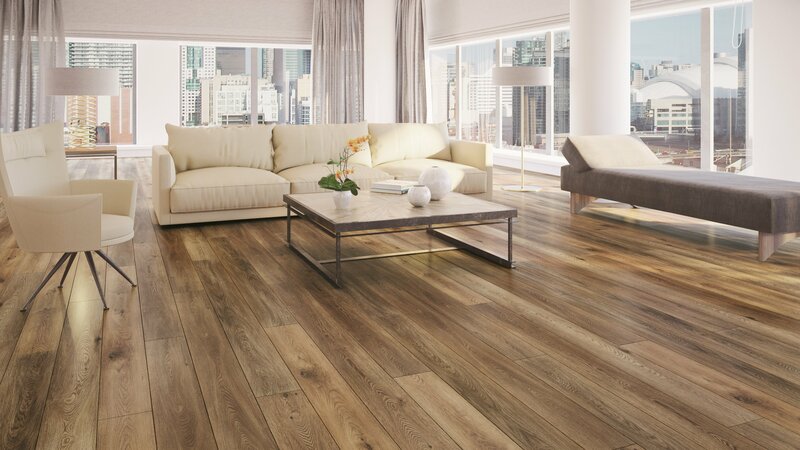 Beautifully designed wider, longer planks in state-of the art textures and on-trend colors to fit any decor. • Micro-bevels and low-gloss finishes add to the overall look and feel of high quality flooring. • Wood grain contours are softly textured. You can feel the difference: warm to the touch, comfortable and quiet underfoot. • 0.5mm (20mils) wear layer. • CorkPlus™ attached cork underlay with Microban® antimicrobial product protection. Welcome to alluring, beautiful floors that will delight for years to come, taking what demanding lives can throw at it. 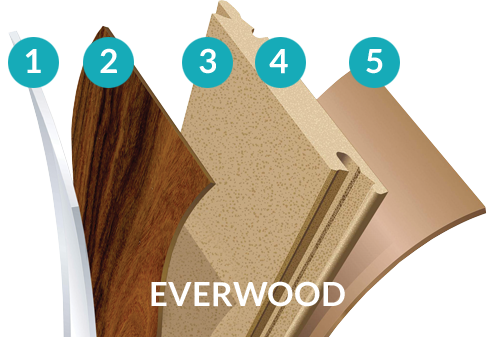 EverWood creates a feeling of warmth from the smallest to the largest, free of transitions or expansion joints. The Look: State-of-the-art wood visuals come in beautiful, wide, long planks to complement traditional, casual, or contemporary decor. Micro-bevels and other finishing details add a remarkably luxurious look. The Feel: Beautiful grains are softly textured with a low-gloss finish. You can feel the difference: warm to the touch, comfortable and quiet underfoot. CorkPlusTM attached cork underlay with Microban® antimicrobial protection. • Micro-bevels and low-gloss finish. • Softly textured, warm, comfortable and quiet underfoot. • 0.3mm (12mils) wear layer. • EverWood Vista does not include CorkPlus™ underlay. Vive la difference! EverTile is a floor that “has it all” – the striking on-trend appearance of large-area ceramic tiles is achieved with uniquely designed warmth and durability. The Look: The alluring beauty of low-gloss ceramic without the coldness. Clean lines, modern styles are perfect for any space in a home or commercial property. The Feel: Warm, warm, warm. And quiet and comfortable. A beautiful, refreshing change for any room, especially kitchens and bathrooms! Luxurious, refreshing change for any room, especially kitchens, bathrooms and laundry rooms. • On-trend styles, larger tile size. • Created in a larger tile size in beautifully appointed colours and textures. • Warm and comfortable. • 0.5mm (20mils) wear layer. 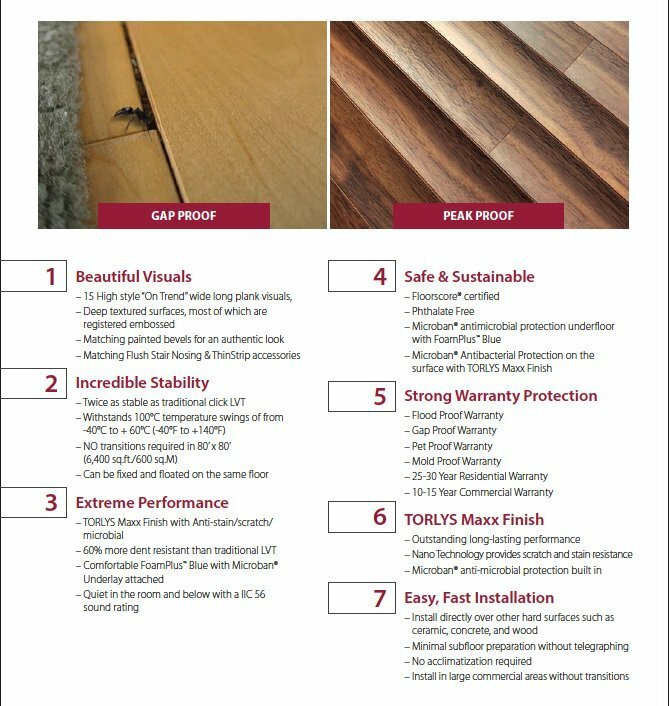 Only RigidWood™ offers a quiet, solid-feeling floor with NO Peaking, Gapping, or Cupping. RigidWood™ has the Smart Advantage of TORLYS high-quality, innovative construction. The new formulation is a unique 8-Layer process that includes the ultra-durable Maxx Finish. The result is an optimal blend of flexibility and rigidity. The FLEX conforms to the subfloor better than ANY other rigid LVT. For a quieter more solid feeling underfoot. PERFECT for concrete and irregular subfloors in renovation. The RIGID creates remarkable dimensional stability. For peak/gap free flooring in extreme cold or extreme heat. PERFECT for ALL season flooring from cold cottages to hot sunrooms. 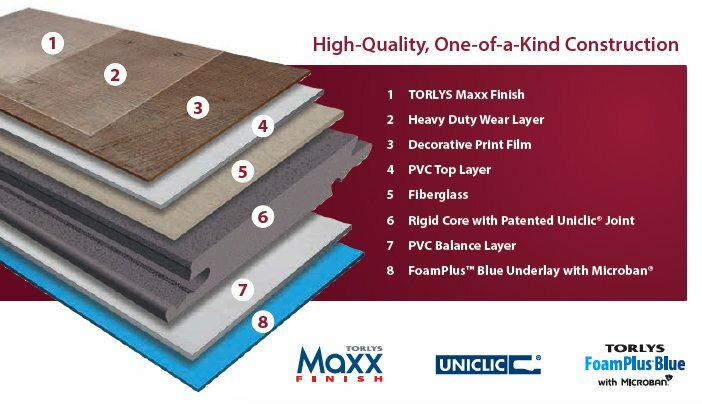 FoamPlus™ Blue underlay attached, with Microban® antimicrobial protection. …and NO Transitions in 80’ x 80’ spaces! NO UNDERLAY ATTACHED – additional underlay required!